If you take advantage of these twelve business meeting management tips, your meetings and teams will function better and produce better results. Actions before the business meeting establish the groundwork for accomplishing meeting results. You can do all the necessary follow-up, but without the pre-work, you won't be successful. Effective business meetings that produce results begin with smart planning. First, identify whether you need other employees to help you plan the meeting (i.e., pulling in people from a few departments). Then decide what you hope to accomplish by holding the meeting and establish doable goals for your meeting. The goals you set for your business meeting will establish the framework for an effective meeting plan. As Stephen Covey says in the "Seven Habits of Highly Effective People," "Begin with the end in mind." Your meeting purpose will determine the meeting focus, the meeting agenda, and the participants you'll need to attend the meeting. It may sound backward, but, once you’ve developed your business meeting plan, make sure that a meeting is an appropriate vehicle for accomplishing the goals you established. Holding meetings is an expensive venture when you consider the billable cost of attendees. Make every effort to determine that a meeting is the best opportunity to solve the problem, improve the process, or create a long- or short-term strategy for your team or department. 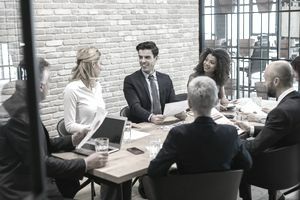 If a business meeting is the appropriate means to accomplish your goals, check with the participants whose attendance is necessary for the meeting to succeed. This may sound like a no-brainer, but it trips up the savviest leader—the key attendees must be available to attend the meeting. Sometimes people send delegates in their absence. If a delegate attends in the place of a crucial decision maker, make sure the designated staff member has the authority to make final decisions that can be signed-off on. Otherwise, postpone the meeting. How many meetings have you attended that started with the meeting facilitator passing out a ream of paper or doing a PowerPoint presentation to launch for discussion? It is frustrating because of getting down to brass tactics; the meeting becomes a group read-in—hardly productive for your business. You can make business meetings most productive and ensure results by providing necessary pre-work in advance of the meeting. Providing pre-work, charts, graphs, and reading material 48 hours before a meeting starts means that everyone comes prepared to jump right in. During the business meeting, if you use the time effectively, you'll build enthusiasm for the topic and generate commitment from the participants. People will feel part of something bigger than their day-to-day challenges. Therefore, a well-facilitated, active meeting that sets the stage for follow-up will produce meeting results. The meeting leader sets a positive, productive tone for interaction among the meeting participants. Effective meeting facilitation starts with a review of the goals, or anticipated outcomes from the meeting, and the agenda. The facilitator helps group members stay focused and productive. Meeting design and the agenda set the framework for the meeting. An effective facilitator, who keeps participants on track, ensures the accomplishment of expected, desired results as an outcome of the meeting. Every workgroup has different personalities that show up for meetings. You have quiet coworkers as well as people who try to dominate every discussion point. Whether facilitating or attending the meeting, you need to involve each attendee in the process of the meeting goals. This ensures that each participant is invested in the topic of the meeting and will follow-up. You’ll not have one member—or yourself—trying to carry the whole load. Discuss real-life scenarios and barriers to success that team members may experience as they try to accomplish the items necessary to produce results. If you need a follow-up meeting, set the time before the participants leave so that it's on everyone's calendar. Actions and planning before and during the meeting play a big role in helping you achieve expected, positive, and constructive outcomes. Your actions following the meeting are just as crucial. Follow-up at the next scheduled meeting is never enough of an investment to ensure results. Publish your minutes and action plan within 24 hours. People will most effectively contribute to results if they get started on action items right away. They still have a fresh memory of the meeting, the various discussion points, and the rationale for each meeting item. Also, a delay in the distribution of minutes will affect your results because most people wait for the minutes to arrive before tackling their commitments. Respecting and observing deadlines and follow-up will help you achieve results from your meetings. Following the meeting, each person with an action item should make an action plan for accomplishing each of their commitments. Whether they write the steps in their planner, delegate the tasks to another staff person, or complete the task immediately, the individual is responsible for follow-up. And, you can improve meeting results by following up with each person mid-way between meetings. Your goal is to check progress and ensure that tasks are underway. Have you ever sat in a follow-up meeting that consisted of each participant telling the group why they were unable to accomplish their commitment? Establishing the norm or custom of accountability for results begins early in your meeting cycle. Follow-up by the facilitator mid-way between meetings helps, but the group must make failure to keep commitments unacceptable. Have participants report on progress and outcomes at the next meeting with the expectation that all participants will have accomplished their ascribed goals. If a task is stalled, at the next meeting see if there is a legitimate roadblock to progress and determine how to proceed. The practice of debriefing each business meeting is a powerful tool for continuous improvement. Participants take turns discussing what was effective, or ineffective, about the current business meeting process. They also discuss the progress they feel the group is making on the topic at hand.